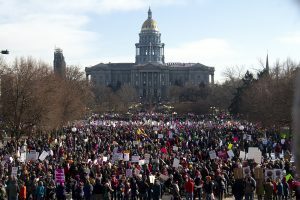 Some time before the inauguration, plans grew to hold a Woman’s March in protest against the new administration, on the 21st of January. This idea really caught on, not only in the United States, but all around the world. 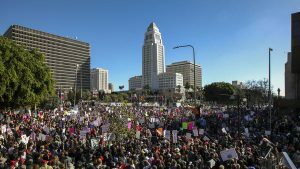 So…yesterday, many, many cities saw a large collection of Women and Men, marching in protest, and making their view of the future be known. The original march was arranged for Washington D. C. but, the movement grew so huge that even in Knoxville, Tennessee, we saw several thousand people come out and participate in the event Here are a few pictures – and there are MANY more online. Woman’s March In Washington, D. C.
Women’s March Protest signs left outside the donald’s hotel in Washington, D. C.
. In spite of the fact that (just in the United States) millions of people came together, there were nearly no examples of violence. There was a great feeling of strength and solidarity that, hopefully, will sustain us against the open Evil that is infecting America and will be with us for some time into the future. 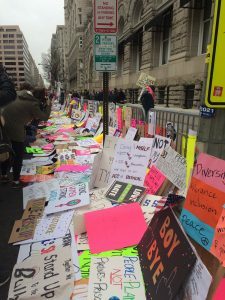 As a final point, many of the protestors left their signs outside the donald’s hotel on Pennsylvania Avenue! Ever since the Election, when I have been on Social Media, or watching the news interviewing donald cultists, I have heard some very consistent messages. I am told “You lost! He Won!”, “You people who hate America are DONE!”, “Get Over it!”, “You lost..it is time to support your President”, and “Stop whining and trying to tear his administration down…you lost!” by the folks that voted for the donald. I, and the many folks like me, are not treated like opponents, with valid, if different values. Rather we are treated as if we hate America, and are the enemy! I have tried to speak to these sad comments with various arguments, but, without success. Finally though, a woman being interviewed as part of the protest yesterday wrapped it up in a strong, and positive package, making a remark that really resonated with me, and, has become my rallying cry for the next few years. “I am not protesting AGAINST anything. I am protesting FOR the things that make America truly great”. We, who disagree with the terrible plans that the Republicans have to burn down the country and destroy as many of the advances our society has made in the past 50 years, need to cling to this statement. We can use it to remind us that we may not be perfect, but, our goals are to help and support ALL Americans…not just the privileged few. We can draw strength from it when it seems the battle is overwhelming…and use that strength to pick ourselves up and do more to keep America great, and support those things that make it so. 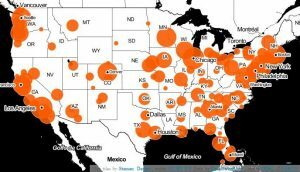 UPDATE: Today, I ran across this graphic, created by Google, which shows the locations of all the Marches in the United States. I assume the data was gathered from searches and results… The size of an orange circle is proportional to the number of people taking part in the March! 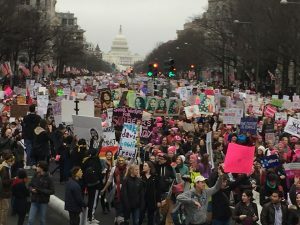 There were very few states that did not have a March… The last numbers I heard were that there were around 600 events, and over 4 million people taking part in them. 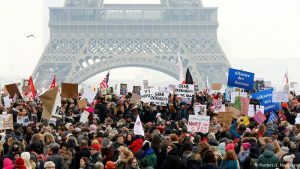 This entry was posted in Ethics, General Thoughts, Humanity, Nuttiness, Observations, Politics, Something Good This Way Comes, Uncategorized and tagged For Not Against, protests, Woman's March. Bookmark the permalink.